In a Victorian first, Western District Health Service (WDHS) is one of 13 Health Services across the South West to discontinue the sale of sugary drinks at its campuses. Health Services from Geelong through to Warrnambool and Portland in the south and Hamilton in the north are taking this transformational step to combat rising levels of obesity. WDHS Chief Executive, Rohan Fitzgerald says the move aims to make the healthy choice easier for patients, staff and visitors and to encourage other public and private sector organisations to support healthier options. 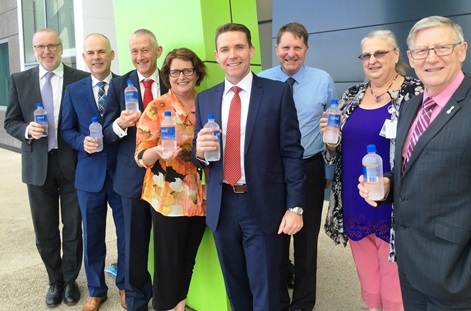 “WDHS was the first health service in Australia to remove sugary drinks from sale as part of ‘GenR8 Change’, a community movement addressing rising levels of overweight and obesity in the Southern Grampians Shire. Since then we have encouraged other health services to ‘defy gravity’ and make the change, because we believe it is vital that community leaders and organisations support people to make healthier choices. We want to take a more active role in ensuring that consumers understand just how much sugar there is in soft drinks and energy / sports drinks and the detrimental effects on health and lifestyle associated with sugary drink overconsumption. As community leaders we need to support people to make better, healthier choices, because the long term implications and health impacts of obesity, particularly for children are profound,” Mr Fitzgerald said. Barwon Health’s Interim Chief Executive Paul Cohen made the announcement on behalf of the Health Services last week and says the health costs and effects of obesity on families, communities and society are enormous. “According to the Australian Institute of Health and Welfare (AIHW), of all hospitalisations in 2013- 14, diabetes was the principal and/or additional diagnosis in 900,000 cases (9% of all admissions). Type 2 Diabetes accounts for 85% of all diabetes conditions and overweight and obesity is a leading risk factor. Another AIHW report based on data collected during the 2011 Census, reveals that almost two in three Australian adults are overweight or obese and one in four Australian children. If we can reduce the number of Type 2 Diabetes admissions alone, we will not only improve the health and wellbeing of our community, but will also improve access and reduce costs to the health sector,” Mr Cohen said. The healthcare providers who have joined the call to discontinue the sale of sugary drinks are Barwon Health, Casterton Memorial Hospital, Colac Area Health, Hesse Rural Health Service, Heywood Rural Health, Lorne Community Hospital, Moyne Health Services, Otway Health and Community Services, Portland District Health Service, South West Healthcare, Terang and Mortlake Health Service, Timboon Healthcare and Western District Health Service. The changes will take place progressively, as existing contracts with suppliers expire and stock is exhausted. Statistics show that Australia’s consumption of soft drinks and sports drinks is amongst the highest in the world, with a study in 2012 revealing that 1.28 billion litres of sugary drinks were consumed over a 12 month period. This Health Service initiative is consistent with the Rethink Sugary Drinks campaign, supported by organisations including the Cancer Council, Diabetes Australia, Heart Foundation, Australian Dental Association and the World Health Organization Collaborating Centre for Obesity Prevention. To walk off the kilojoules contained in just one 375ml can of soft drink, an adult needs to travel around 2.5kms and this increases to over 3kms for a 600ml bottle, which can contain up to 16 teaspoons of sugar. Professor Steven Allender, Director of the World Health Organization Collaborating Centre for Obesity Prevention at Deakin University, working in conjunction with a range of community partners undertook a comprehensive study of childhood health in the Great South Coast in 2015. “Across Australia more than three quarters of kids exceed the WHO guidelines for daily sugar intake. The research among children in the Great South Coast shows that, as with many parts of Australia, overweight and obesity is a major issue. The willingness of the leaders in the region to address this problem is cause for great hope. This health service initiative is just one example of how individuals and organisations, big and small, can and must work together within their areas of influence to make the change they want to see in their communities,” Professor Allender said. Linggang Lei, Anna Rangan, Victoria M. Flood and Jimmy Chun Yu Louie (2016). Dietary intake and food sources of added sugar in the Australian population. British Journal of Nutrition, 115, pp 868-877. doi:10.1017/S0007114515005255.